I am in love with these shoes and not just because they're easy to pack in a bag. The cushioning is very responsive with a sweet, smooth transition that allows you to feel the road. Being a stepping stone to the trendy "barefoot running, its minimalism allows you to adapt your technique towards a forefoot landing. At the same time it provides enough cushioning to protect you if you are a moderate heel striker. I have noticed the extra flexibility in the shoes sole has made a difference in strengthening both my feet and calves. I have been running outdoors roughly 6 km at a time through the rain and light snow. The D.W.R coating is holding up to its end of the deal, keeping my feet warm while at the same time protecting them from the elements. Nobody likes stinky, squishy, wet feet. The shoes upper is also coated in reflective material which is beneficial if you're a nighttime runner. In my opinion the available colour scheme for both the men's and women's shield series has stepped up visually from last year. 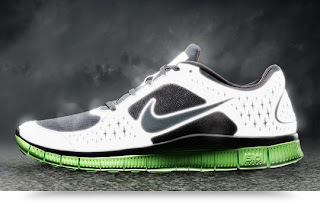 I found that fitting the Nike Free series I tend to move up a half-size to allow for a comfortable fit. The attached tongue is seamless which allows for more upper-support and creating a "sock like fit." The only thing that I would question with this shoe is its lifespan. It starts to lose its cushy first impression after three months of running a few times a week. Everything else aside, I'd recommend this shoe for an on the go-runner. This is a excellent travel bag shoe that delivers.